As the IHM Constitutions state: "The community is committed to a life of service to the Church: the contemplation of the Word and the spread of his message of salvation through the various works of education" (#5). 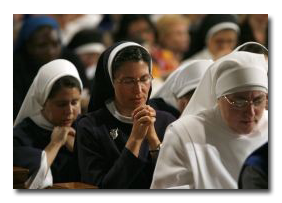 This twofold apostolate expresses itself in the dedication to prayer that each Sister has as well as her commitment to spreading the word of God. It is only through her life of consecration and prayer that each Sister is able to spread the Good News. "The Sisters of the Immaculate Heart of Mary affirm the primacy of their consecrated lives as daughters of the Church and offer themselves to serve the Church in its mission of transmitting Christ's message of salvation" (IHM Constitutions, #66). 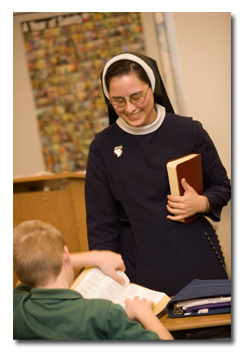 "The Sisters engage in the works of Catholic education, including spiritual retreats, serving the people of God at every level and in any program which provides an opportunity to spread the Gospel message entrusted to the Church" (IHM Constitutions, #67). Father Masmitjá realized the need for education in the modern culture. He also understood that it could only be successfully accomplished through prayer. His vision was one of transformation: "Thus the Sisters would instruct others, especially young women, in the Catholic faith so that they in turn might become the instruments for instructing and strengthening others, and in this fashion rebuild the foundations of morality in a society weakened by its divorce from religion" (#65).